« What are tractors for? Last week, Siri wrote about what is surely the most common use of tractors in agriculture – turning a field with grass or other plants growing on it into a field of bare dirt. In most of today’s agriculture, this means huge tractors pulling huge implements. On small farms like ours, we use many of the same implements to do this job – plows, chisel plows, discs – just smaller versions of them. 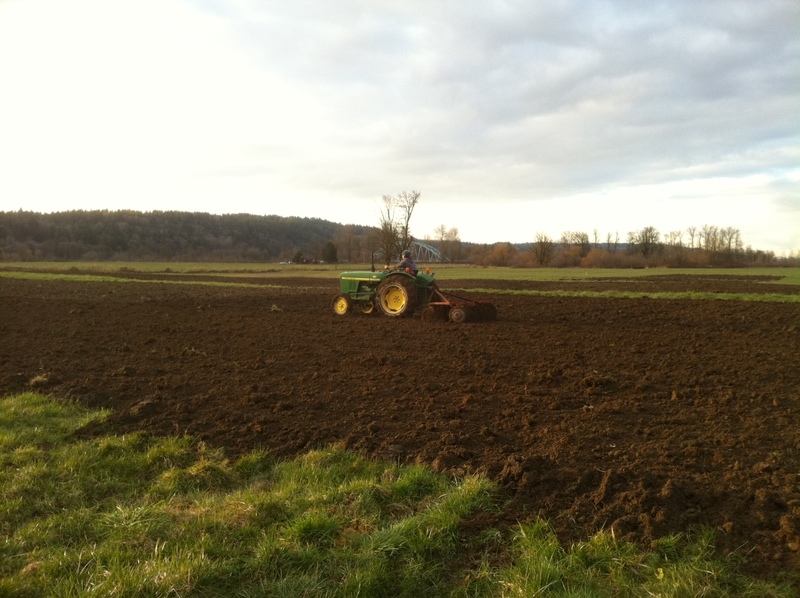 Once a field is prepared for planting, on our farm the next step is putting seeds or seedlings in the ground. 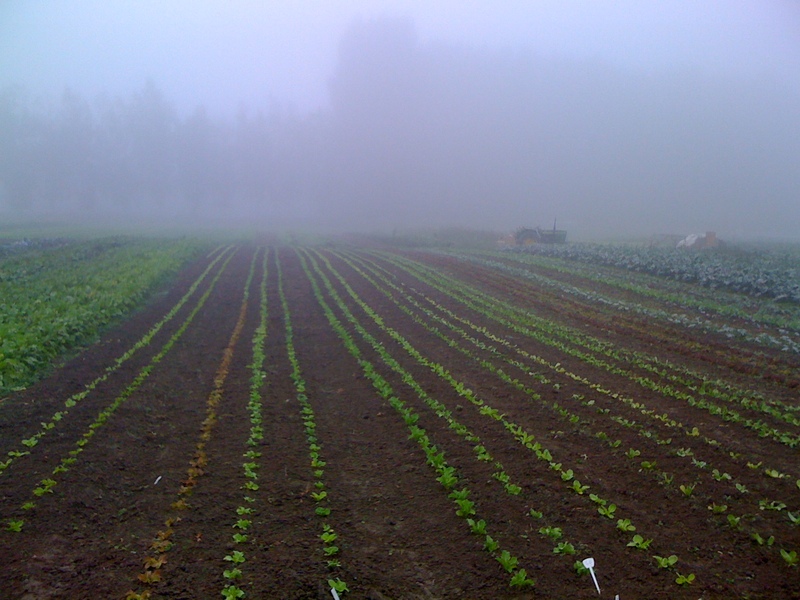 On bigger farms than ours, farmers may plant only one or two crops once or twice a year. Market farms like ours, though, need to have a consistent supply of vegetables for months on end. You can’t achieve this by planting acres of lettuce and kale just once in the spring. Instead, we plant smaller quantities, just a bed or two at a time, of a diverse mix of vegetables every week. 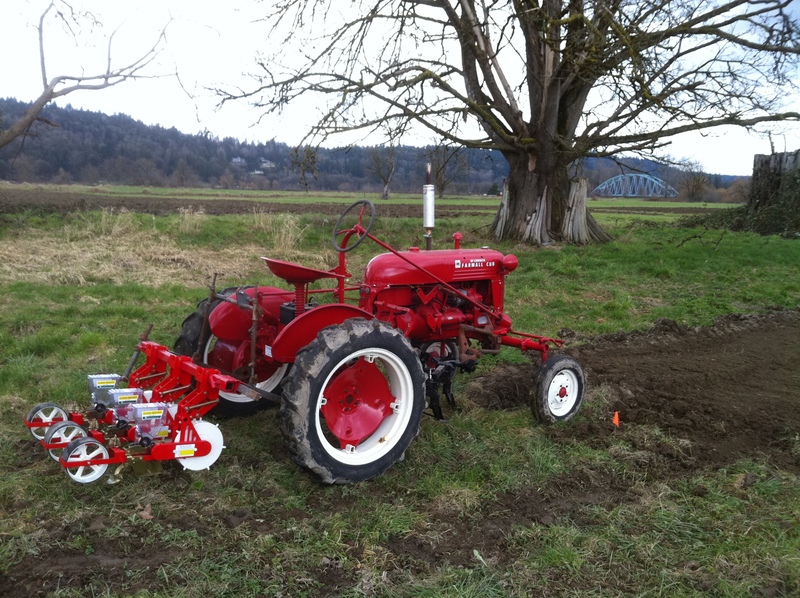 This is where our smaller tractors, and especially our new 1950 Farmall Cub come into play. Our Cub does four jobs on the farm that modern tractors aren’t as good at doing. It creates our beds, it marks rows for transplanting, it seeds, and it cultivates. We make our beds on the farm by driving the Cub over recently tilled soil in as-straight-as-possible lines back and forth every 5 feet. Every bed on our farm is 5 feet wide by 125 feet long. Coincidentally, the Cub has 8 inch wide tires that are spaced 5 feet apart, center to center. This means, when we drive the tractor over freshly tilled soil, the tires create a depression where we can walk and leave a 4 foot wide raised bed between the tires for us to plant into. On our farm we set up flags every 5 feet on both ends of the bed for the tractor driver to aim at, ensuring that our beds are mostly straight and well spaced. At the same time that the Cub is marking a bed, it might also be marking rows for transplanting. For ease of cultivation (which I’ll discuss shortly), all the rows of vegetables within every bed are spaced identically. That is to say, we plant a maximum of three rows per bed, each spaced 15 inches apart. The Cub marks rows to transplant into by setting wheels down on the bed-top that make a line in the soil the length of the bed. Once a bed is marked, we’ll return with trays of seedlings to transplant into one, two, or all three rows depending on the plants’ need for space. The other way we get rows of vegetables is by using our tractor mounted seeder. This year we purchased three Jang Seeders, which are ganged together and mounted on the back of the Cub. By lowering the rear hydraulics on the tractor, the seeders are set on the ground. As the tractor drives forward, the ground turns the front wheel of the seeder. This wheel, in turn, turns a barrel inside the seed hopper which picks up one seed at a time and drops it into the ground. The seeder then covers the seeds and compresses the soil behind them. The last thing the Cub does is cultivate. The word cultivate is a funny one, because it has two agricultural meanings. The meanings most people know are “to grow plants,” or “to prepare land for farming.” That is to say, all the plowing, discing, and tilling Siri talked about in the prior post. What we mean when we say cultivate is to kill weeds. That is to say, hand weeding, hoeing, and tractor cultivating with the Cub. Beneath the belly of the Cub are mounted a set of knives that can be raised and lowered with the tractor’s hydraulics. To cultivate with the tractor, we move these knives so that they disturb the ground in the space between the rows of vegetables, killing only the weeds. Tractor cultivation is very tricky, for if the tractor driver goes off course even a little it can mean killing lots of vegetables. The engine and seat of the cub are offset to the left so the driver can keep a close watch on the knives and the vegetables. Most of today’s farms use chemicals to kill weeds, and no company that I know of has manufactured a cultivating tractor since the 1980s. So on farms like ours, which don’t use chemicals for weed control, you’ll often find old fashioned tractors like our Farmall Cub or an Allis Chalmers G for killing weeds. There are tons of other uses for tractors on a farm. Today, I pulled an ancient cedar root out of the field. Next week we’ll use the front end loader on a tractor like a cherry picker to help us work on the very high roof of our newest greenhouse. One of the funny things about becoming immersed in a subject is how you forget how little you knew before you began. After Siri wrote the first post about tractors, a number of people have admitted to us that they didn’t actually understand much of the process necessary to turn a grassy field into a field of vegetables. Moreover, it seems that many of the details about what we do on the farm are lost on our audience because most people aren’t familiar with what farmers actually do or the terms we use to describe our work. We ourselves didn’t know much about the technicalities of growing food before we started farming. The role tractors play is but one small part of the whole process. But now, at least, you’ll understand that part. If you've been paying attention, you'll know that this photo belongs in Part I. Extra points if you can identify the implement. Awesome post! Love love love the tractor. Thought you guys might have an old Ford, but I like that Farmall. That last photo is a J-D, though, isn’t it? With discs? I can’t quite see the implement and my knowledge here runs thin. Really like your detailed posts on the flooding, too. Was out at the Clean Greens farm just before the flood and could see the detritus still around from the last. Just printed our CSA form, will send it in Monday! Yes, the green tractor is a JD 950, which we use for tilling and pulling heavy things, like a disc. 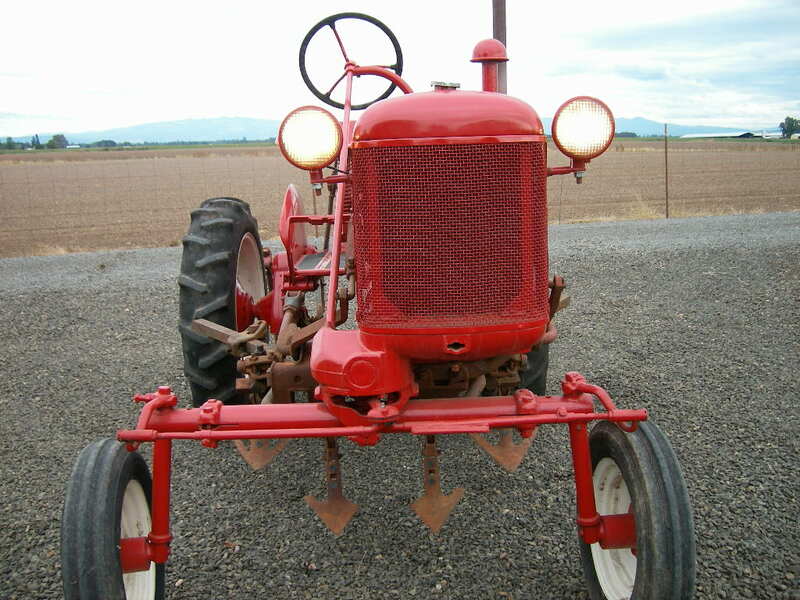 The Farmall Cub (c. 1950) is for seeding and cultivating.